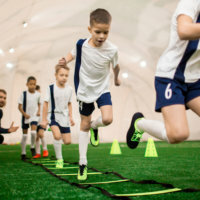 Our youth sports performance training program is designed to create a foundation of overall athleticism in a fun, positive and high success environment. 1 on 1 training offers the highest level of individualized programming. Our trainer will create an individualized program based on our initial evaluation/screening. Each workout will be coached by the trainer with each exercise observed and modified according to the client’s abilities and goals. 1 on 1 training is ideal for post-rehab clients, clients new to fitness or those who want the highest level of attention. Small group training is our specialty at Train Fitness as it offers nearly the same level of individualization of 1 on 1 training plus it offers the camaraderie of working out in a group. Our small groups are limited to 4 clients or less to ensure adequate attention to each client by our trainer. Our small group classes are ideal for clients ranging from high school athletes to those that want to maintain the fitness to chase their grandkids. Large group training is offered at Train Fitness. These classes incorporate a variety of exercises to improve mobility, strength, power, agility and endurance with other motivated individuals. Large group training is ideal for those who love the energy of working out in a large group and do not require as much attention and guidance from our trainer as 1 on 1 or Small Group training offers. It is also great for sports teams looking to improve their fitness and physical capabilities outside of their regular practice schedules. Our youth sports training classes are designed to help young athletes learn the fundamental movement skills that will enhance their athletic ability. Our trainers focus on improving each athlete’s mobility, stability, acceleration, speed, strength, and power. Including all these facets of athletic development ensures that we address each athlete’s weaknesses while maximizing their strengths. All of our clients at Train Fitness are taken through a Functional Movement Assessment prior to the start of any training program. This initial assessment looks at movement quality, mobility and stability to determine how to help our clients achieve their goals while reducing their injury potential. The knowledge gained in this assessment allows us to individualize each of our clients’ training by modifying each of the exercises we do to their appropriate level. We will also evaluate strength, power and endurance to see where each client needs to focus their training. New clients participating in Small Group Training or Large Group Training sessions will also start with a series of Prerequisite Classes that will teach proper form and execution for various exercises that will be a part of each group session.